Dead City Haunted House is a completely new haunted house attraction for 2018 and one of the hottest tickets this Halloween season. This 30,000 square foot event has over 50 rooms of terror that will be sure to make your skin crawl with Halloween screaming fun. 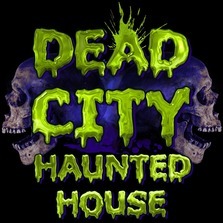 Dead City features the Haunted Mansion, Cannibal Kitchen, Bad Seed Pumpkin Farm, Werewolf Forest, Zulu Terror, Spider Kingdom, Curse of Egypt, Science Lab, Vampires Lair, Dead Mans Morgue, Nightmare Nursery and Jason's Closet. Dead City also has Utah's largest 3-D attraction included inside. In this section you put on 3-D glasses which distort the brightly painted amazing artwork, scary clowns, and toxic creatures creating a truly amazing immersive experience. For kids desiring a slightly less intense experience, a "Death be Gone" glow-stick can be purchased at the ticket booth for an extra $1 that signals the actors to keep their distance as this patron is more timid. No minimum order, all orders accepted with Utah Kids Club! !